Non-Sportbike Training Days are for motorcycle riders wanting a concentrated learning opportunity at real world speeds. Track days and track schools are a great way for any rider on almost any type of bike to develop their skills without the typical dangers of street riding. Non-Sportbike Street Rider Training: Non-Sportbike Track Days are held on a closed course (racetrack), which means you learn in a safe environment and at real-world speeds (not race speeds). Learning on a racetrack allows you to ride freely and concentrate on advancing your skill level without the typical hazards faced on the street…potholes, sand, tar snakes and Buicks. Ken is the primary classroom instructor. I know what you’re thinking…I don’t want to ride on a racetrack with a bunch of crazy kids on their GSXRR6CBR Ninjabikes. Well that’s good, because if you come to a non-sportbike track day, you won’t have to. Non-sportbike Track Days are for “regular” riders on big bikes, small bikes, touring bikes, adventure bikes, vintage bikes, and even cruisers. Let me repeat…Non-Sportbike Track Days are training days designed for regular street riders! No crazies on race-bred sport bikes will be zipping by at warp speed. For the most part, participants will be experiencing their first time on a racetrack. If it’s your first time, rest assured that you will be in good company. It’s the best investment in fun and skill development money can buy. Perhaps you’ve taken the MSF BRC, ERC, ARC, Lee Park’s Total Control, or some other advanced parking lot training course. These courses are terrific for building the fundamentals of motorcycle control, but applying techniques in a parking lot at 20 mph does not train you to deal with challenges you face every day at typical street speeds. Haven’t taken an advanced parking lot course? 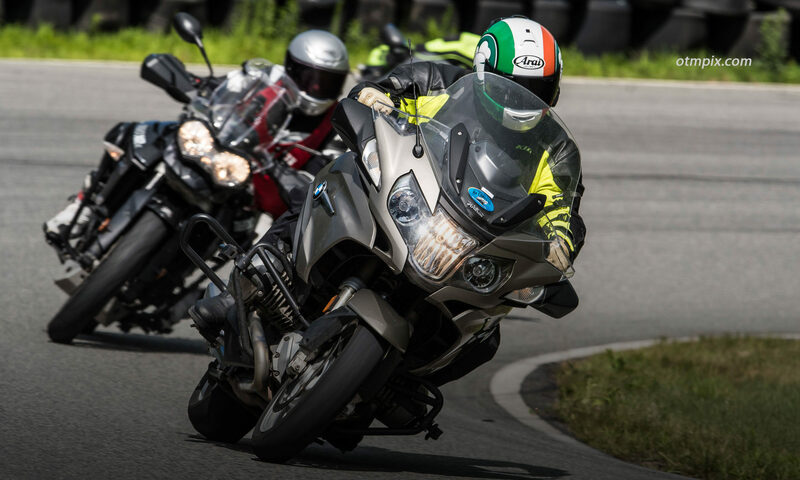 No worries, the Non-Sportbike, Street Rider Training Track Day is designed for riders of all skill levels, from those with a few months in the saddle to riders with decades of riding experience. Read more about the benefits of track days. You ride Your Own Bike for this event. If your bike is in good condition, bike preparation can be done in 2 minutes! Your bike must be in excellent roadworthy condition with plenty of tire life remaining. There can be no leaking of any fluids – be sure to check your fork tubes! Brake pads should have plenty of material left. Mirrors need to be removed or taped over. Do not worry about your headlight if it’s plastic. If it is glass, just make an X with tape… don’t completely cover it. Riders will be responsible for having full motorcycle gear. We do NOT provide gear! Helmets must be FULL-FACED. High quality modular helmets will be allowed but must remain in the locked position when on track. At a minimum, you should have a motorcycle jacket and pants. If you don’t have gear, you can purchase it fairly inexpensively. Cordura Motorcycle Pants are okay as long as they have armor. “Kevlar” Jeans with armor or a padded under suit are allowed. NOTE: Regular Jeans are not acceptable. Chaps can be worn over Kevlar jeans with armored knees. We STRONGLY RECOMMEND a CE approved back protector, but is not mandatory. If your jacket has a pocket for a back protector, you can get a quality one for about $60. Gloves MUST leave no exposed skin. Gauntlet gloves overlap the jacket when you are in the riding position. Boots must be over the ankle and sturdy with rubber soles. They must overlap the pants…no exposed skin. –“I wanted to thank you for an immensely enjoyable time! I was a bit nervous coming into the day, it being my first ever track day, but you guys put me at ease very early in the game. I wrote down on my note pad in big letters RELAX,HAVE FUN. I wasn’t pressured in any way that I had to go fast. That being said I could feel myself going faster as the day progressed with the observations and instruction of your staff. My friend and I thought the timing of the sessions throughout the day was perfect. Just enough time on the track not to get too tired and just enough time in between your sessions to rest and think about how to improve, have class time, and not get bored. The availability of the instructors was impressive also.” -Glenn M.
–“The Non-Sportbike Track Day was an outstanding learning tool and was great fun! The ability to practice what you learn in the classroom on a controlled track is fantastic. I heartily recommend this to all street riders interested in riding better and having a blast.” – Ed C.
–” Once I learned the lines of the track, I was able to totally focus on cornering technique. Since then, I’ve been smoother into and out of corners.” -Todd R.
Riding in the Zone, LLC is chartered through the American Motorcyclist Association and insured by the Philadelphia Insurance Companies. I’m really glad I attended and am looking forward to the next one! Once I learned the lines of the track, I was able to totally focus on cornering technique. Since then, I’ve been smoother into and out of turns. Great vids. However, it appeared that some of the riders in the first vid with the cruisers and big bikes; the black helmet and brown jacket, the yellow hi-viz guy, and the grey and black jacket, were using a hybrid riding position, i.e., a partial hang-off, but with the head and torso shifted back toward the outside, counterweighting the bike. They didn’t look planted and in control, there appeared to be some wobbles. The second group also had some, but not quite as much. I attended a session last June and am waiting to see the 2016 dates. I live in south Florida and am planning my summer ride north. Your event is great reason to plan a trip. John, The 2016 dates are likely to be May 24 at Loudon, NH (or possibly the week before) and August 22, 2016 in Palmer, MA. Check back to confirm the NH date. I look forward to meeting you. I attended the non-sportbike day at Palmer in August and was totally satisfied with the instruction and the track. This was my second time to attend one of these TTD events and I came away with renewed confidence in my ability to ride on the street. The chance to get professional instruction and practice over and over in a safe setting is only available at track days like this. The track was fantastic and the classroom sessions with the on-track instructors gave me instant feedback on cornering techniques. It was well worth the trip to Palmer and I look forward to seeing more days scheduled in 2017. Just wanted to say thank you for an awesome day yesterday! The best training I have had on a motorcycle ever! The access to the info from your staff, the post ride sessions and overall experience was unmatched!! Many Thanks and I will absolutely be back again with my friends!